Over the last 5 years many people have contributed to the society’s success. When golfers turn up on Monday, Wednesday and Friday maybe they do not realise what has gone on to make the process so easy. Someone has to decide the competition format, collect entry money, prepare scorecards, check results and manage handicaps. Now we have a committee who cover all aspects of the organisation, and we are indebted to volunteers who help, and sponsors who support our competitions. First of all, a list of our captains who have had to oversee the smooth running of all the individual parts. From day one Graham White took on the mantle, until May 2011 when he was replaced by Barry Barker. 2012 saw Kevin Smith become our captain, and he was followed in 2013 by Paul Briggs. Dave Rollett has been in charge from 2014 until the present, and shortly Dave Lloyd replaces him in May 2015. The society has been in very safe hands and it looks like continued success is assured. Every captain (except Paul who returned to the UK) took on the role of president following their year, indeed Kevin stayed on for a further year to fill in for Paul. Every captain though, has been well supported by the committee. 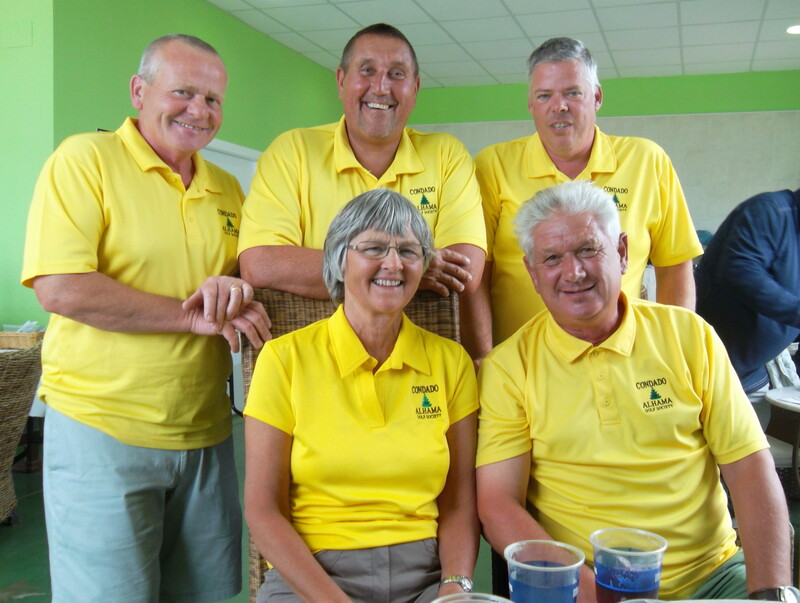 From early 2011 we had people in place to manage the roles of treasurer (Phil Tann), secretary and socials (Cath Emmett Smith), Competitions (Graham White & Dave Lloyd), handicaps (Barry Barker) and ladies representative (Kim Lloyd). 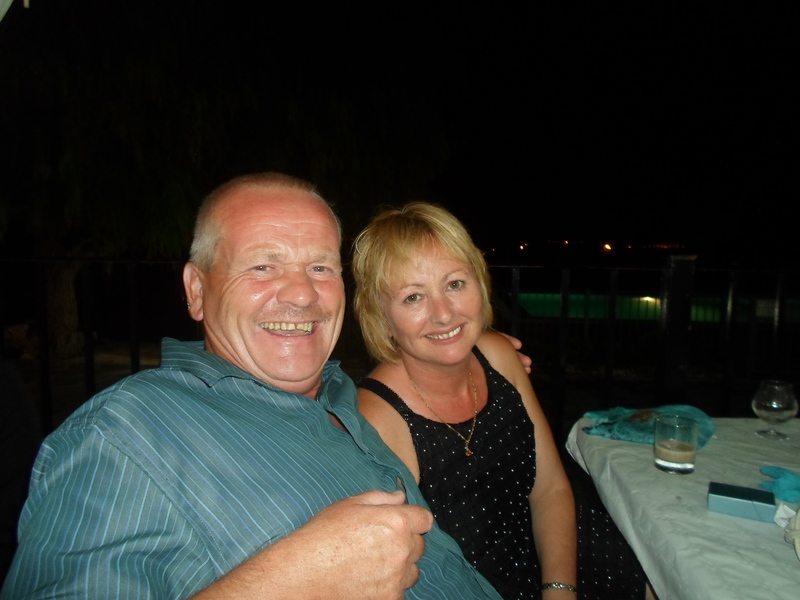 Unfortunately in the last 12 months we have lost Graham, Cath and Paul, but we have added Barbara Rollett (secretary), Alicia Saunders and Kim Lloyd (social secretaries) and Kevin Smith (memberships). Remember it easy to pick fault, but these people have given up much of their time to make everything run smoothly and fairly. Special thanks must go to Neil and Lynn Simpson who have allowed the Clover to be our home, and provide free sandwiches (and shots!) each Friday. Lynn’s mother Doreen and her friend Christine have prepared the sandwiches each week. Many other members have volunteered to hand out cards and collect memberships on Friday mornings. This has reduced the burden on the committee and is much appreciated. Ken Saunders organises mid-week awaydays to the other IRM courses. We have had several major competitions and also special events which have been sponsored by our members. Sandy and Dorothy Simpson, Fred Twomey, Barry Answer, Paul Harrington, Paul Culligan and Neil Simpson to name a few. Also we have had sponsored events by Apollo Air, Trophy Box, Eden Health & Beauty amongst others. Many competitions have received sponsorship from local companies and businesses and that is also appreciated. Thanks also to IRM who have givcn the society course vouchers on a weekly and quarterly basis, also ad hoc donations for special competitions. Our captain is given courtesy of our course for his year in office. .
Whilst Barry Barker, and later Dave Lloyd and Graham White organised the UK & Ireland team, Jan Skjold and Jan Halvdan Olsen led the Sacndinavians. Also this maybe a good time to mention Phil Marlow, who has supplied us with society shirts during those years. Every one has our fir tee condado logo which gives us some individuality. At the start we had a choice of colours – then in 2012 we went canary yellow. 2013 was time to turn green, and last year we were plum (which was my favourite). 2015 we are royal blue. .
2010 – 2011 black with white hoops…..
2010 – 2011 white with black hoops…. 2010 – 2011 red with white hoops…..
2012 a flock of canaries……. 2014 looking good for the team photo ……..
this is the new colour for 2015……..
Next week’s review will see us party and dress up! 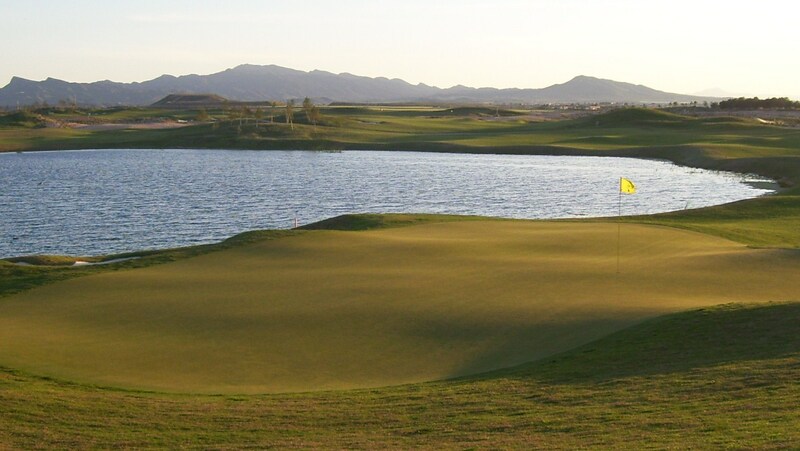 This week there were 47 players in the pairs competition, but there were reasons why it was not too enjoyable – a strong, freezing cold wind and difficult pin positions, especially on hole 13. Wind behind, the par 5 was reachable in 2, and I did so albeit in the hollow to the right. I putted up to the right of the flag away from the cruel slopes and left myself an 8 foot slightly downhill putt. So a birdie 4 would have given me 5 points (with my 2 shots). I went for it, just narrowly missing to the left. Almost dead weight – but goodbye, it kept moving and back down the slope it went, to the place I had been 2 putts earlier. 4 further putts later I gave up trying to get it back on the putting surface – nil points! A great front nine of 19 points ruined by this crazy pin position! Gave up hope then and only managed 6 points to add to that! Nearly all the 47 players failed to score a point on 13, with only 2 managing a par! We were back on the correct tees, but this, added to the wind, cold, fast greens and very difficult pin positions meant that the best score in the mens division was only 31 points! Kim & Dave were best of a bad lot……..
Will players make sure their cards are marked correctly and clearly – it took some time to decipher some of them this week. Kjell Mundheim had a bad day, his trolley blew away towards the water on 4, only just being saved after a couple of players made a dive for it! Also maybe a record with a total of 2 points on the front nine! Next week is a 4 person texas scramble. 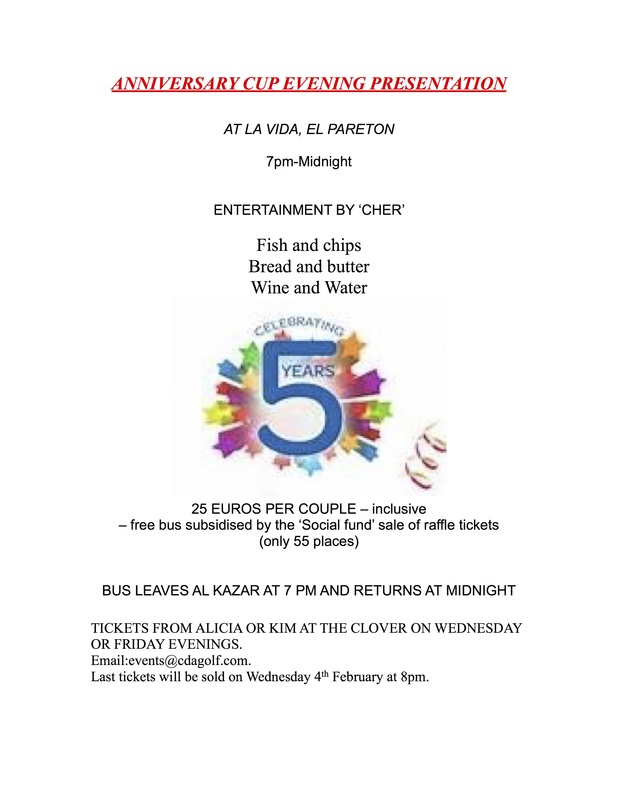 Tickets are on sale for the anniversary trophy party night on February 6th from Alicia or Kim priced at 12.50€. If you have not already seen it, check out the previous blog, which is the first part of a celebration of our first five years. Next week (about Wednesday) I shall add part 2 of our story, which will take a look at the people behind the scenes. 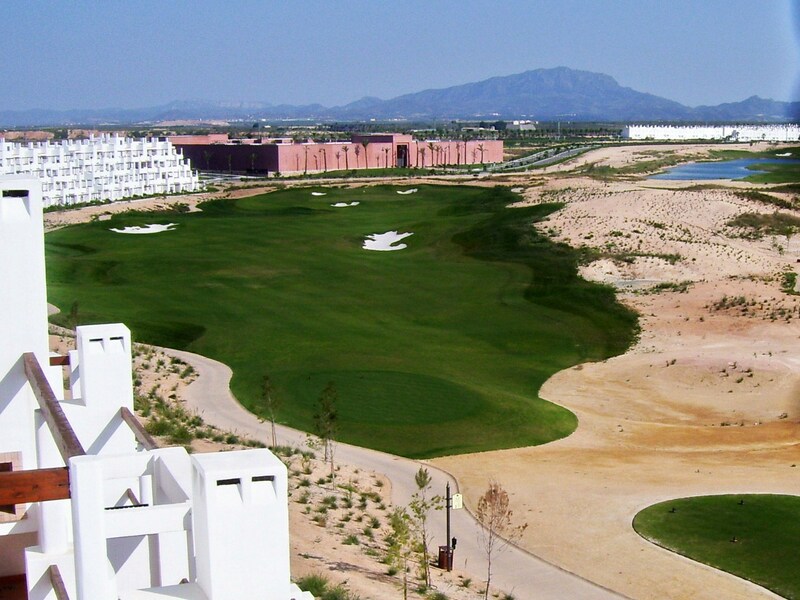 In the early days Alejandro (the head greenkeeper now preparing the Paris course for the 2018 Ryder Cup) had plenty of investment from Polaris, along with about 20 staff. Since the downturn the present greenkeeper, Jonathan, has had only half that number to maintain the course, but has done a magnificent job in presenting it in excellent condition. We understand the financial pressures involved in running the 6 courses and appreciate that we still have this great golf course. The society has gone from strength to strength since February 2010, and the course has had it’s ups and downs, so here is a pictorial record from the grass roots (literally) to what we have now. 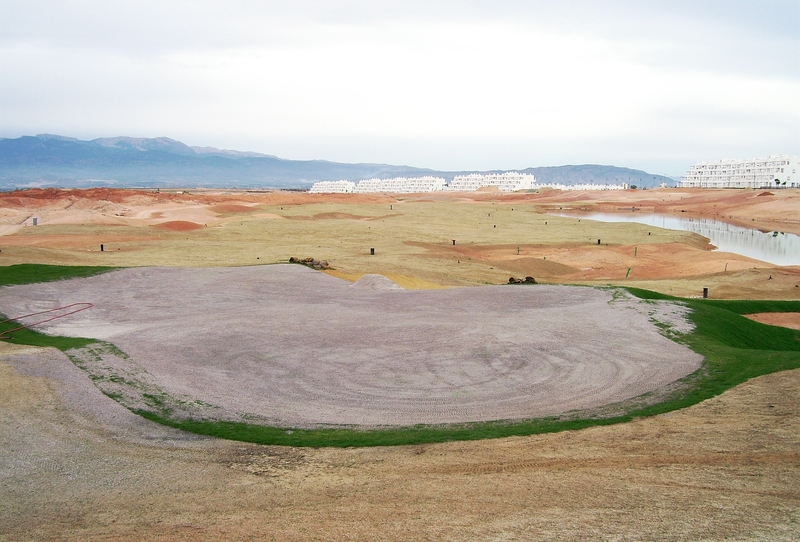 This week I look at how much the course has changed, and the photos show that the foundations of the course were very well laid out and will stand the test of time. In future weeks I will look back at other aspects which have been recorded on this blog. So here are images to either remind you or inform those who were not here then. how it became, and is now……. 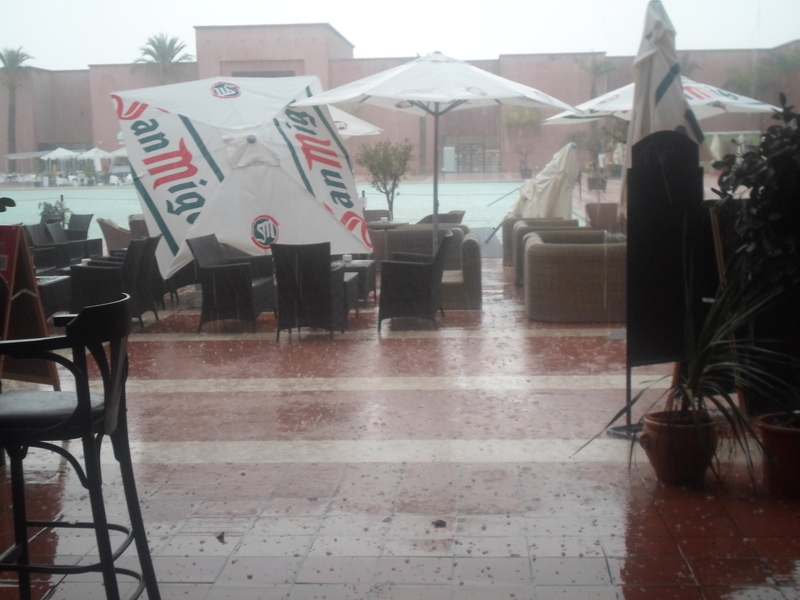 It doesn’t look like this now!……. 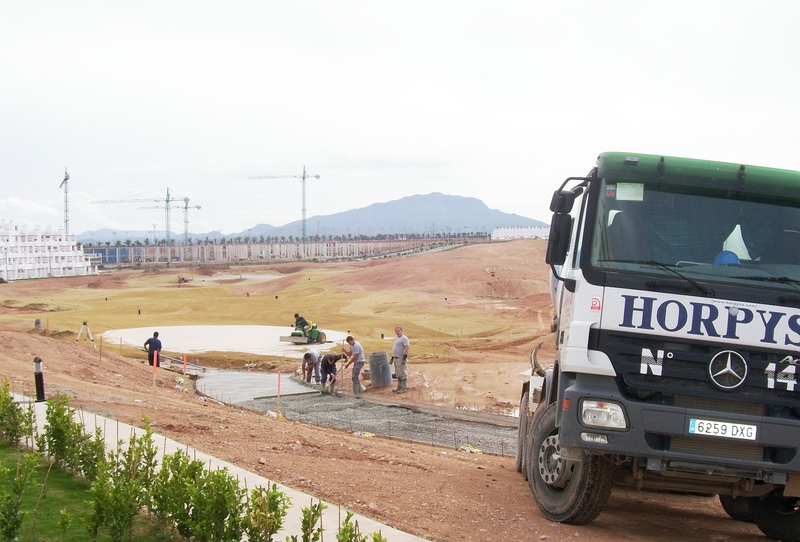 a deep base for drainage……..
another sight of the bad old days…..
6 magnificent tees to choose from…..
a fantastic view across to the mountains……. 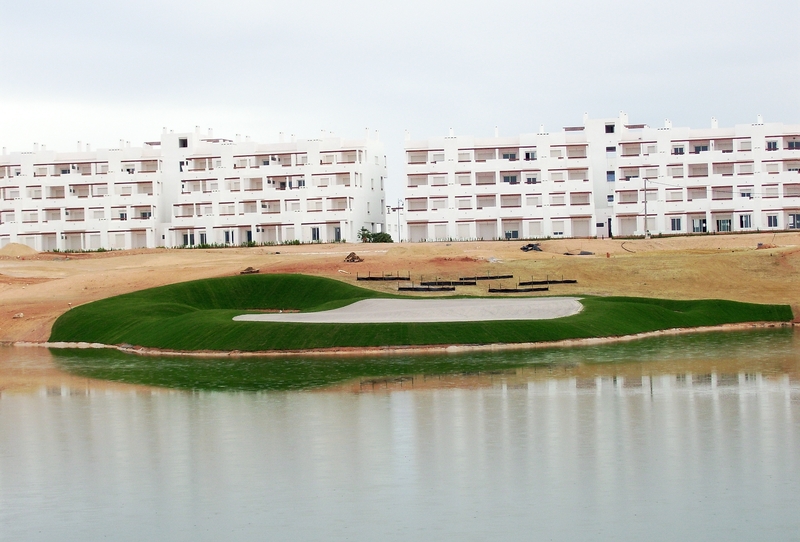 laying the basis of the hole…..
doesn’t look any trouble yet…..
now one of the easier par 3’s…. 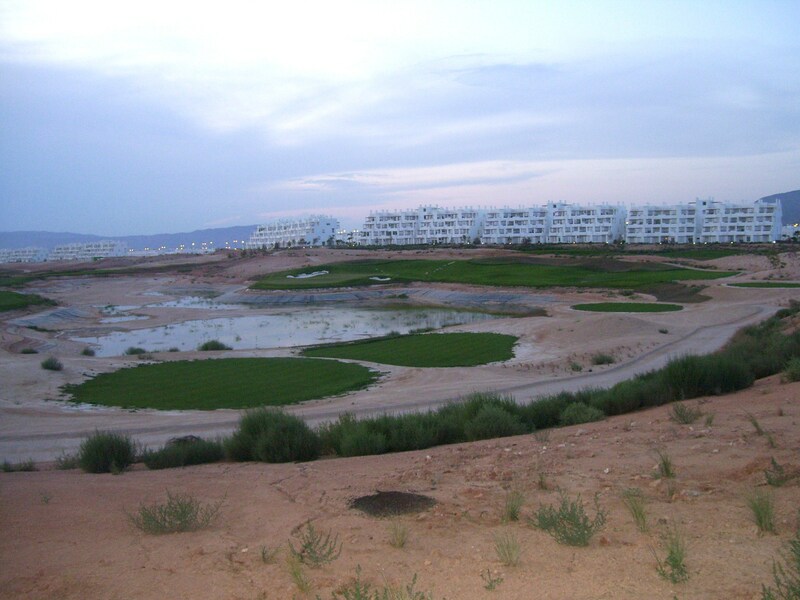 now looking to the green…..
the floods of 2010 again…..
a nice view now back down the fairway….. 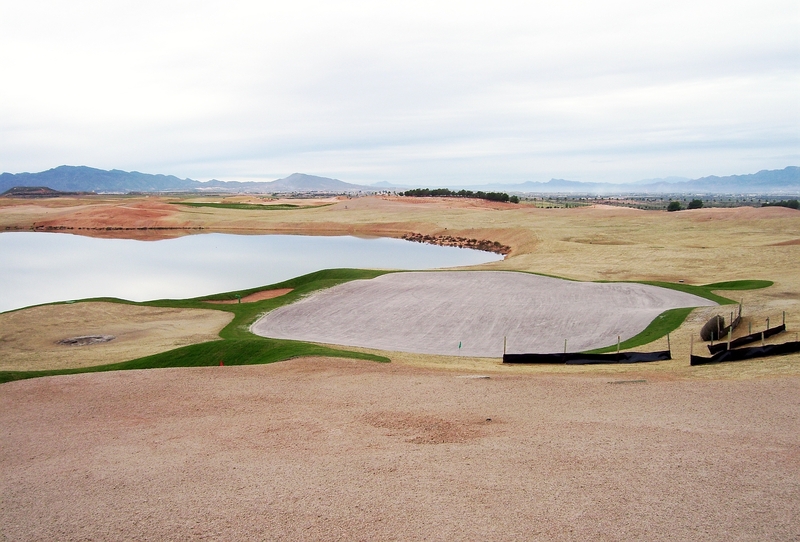 Practice putting green is formed……. and now one of the best facilities…..
had to move trees to prepare the land…. 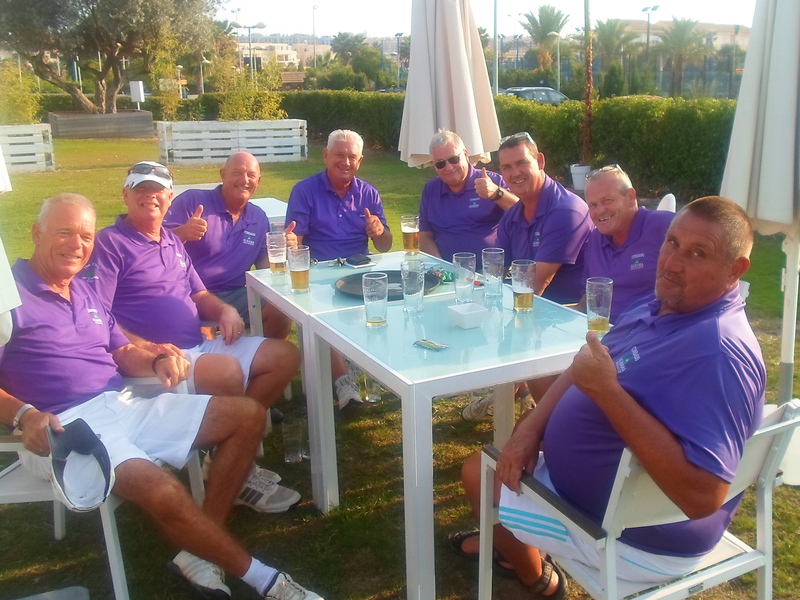 players can have drink after golf now…..
Well, that is part one. Next week expect a different angle on our history. The anniversary cup presentation will be at La Vida in El Pareton Friday night on Friday February 6th. There will be the large fish and chips etc and the entertainment at 12.50 a person and we will subsidise the bus cost from the social fund. The meal will be served as soon as we arrive, wine on the tables and waitress service to order drinks as usual. Tickets will be on sale from Wednesday night in the Clover. 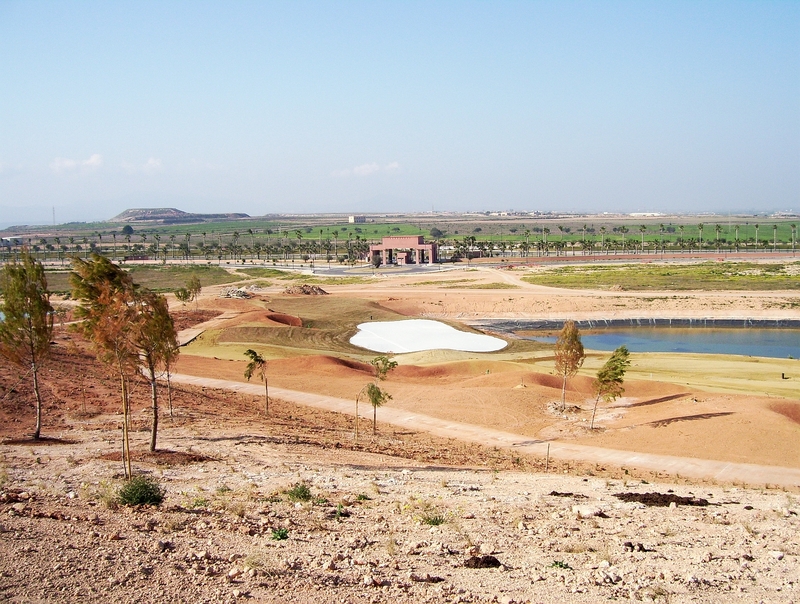 Also contact events@cdagolf.com if you are not yet here. 50 players was an excellent turnout for January, including 8 ladies. A lot of cloud and a strong wind which developed as the round went on, and changeable weather – jumpers to start, then short sleeves, and finally every item of warm clothing in the bag was used! The men were still off the forward tees so their scores did not count for handicap purposes, although the ladies did. The greens were in fantastic condition, very fast and smooth, and the positioning of the pins meant that some approach putts had no chance of stopping close if the hole was not found! Here you see the new colour society shirt as modelled by Chris McAllister. and this is me (no not a terrorist) on the 16th……. 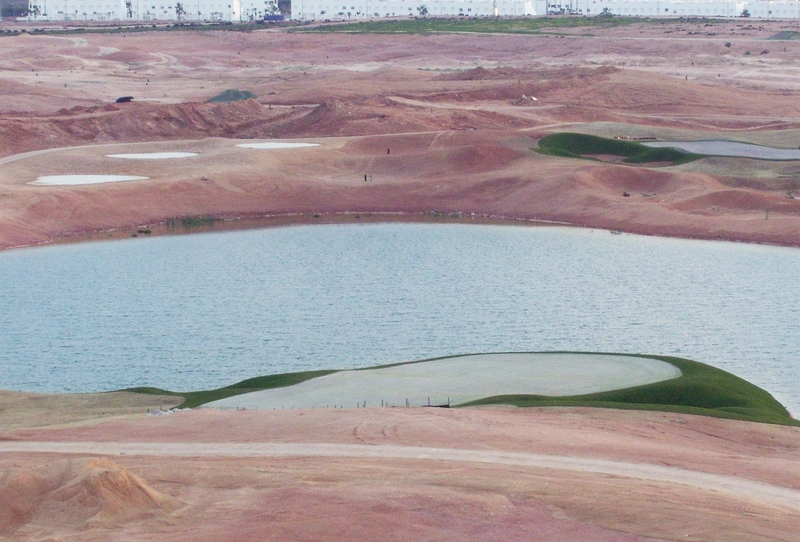 don’t think Chris King has ever been here before…… his tee shot on 17 finished in a bush on hole 8………..
Jostein Landsvik’s tee shot from 14 nearly went in the lake by the Al Kasar……..
Next week is a pairs aggregate competition, which is a qualifier for handicap purposes. 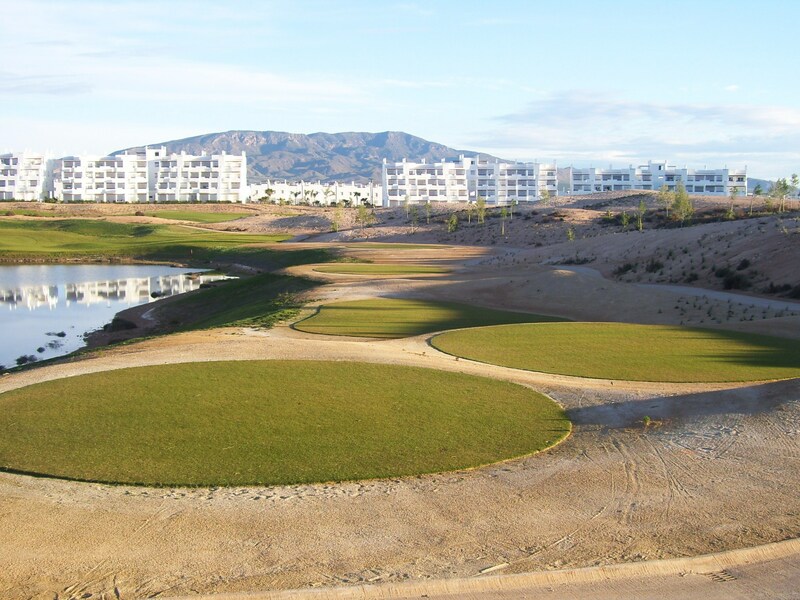 The men’s competition will be dependant on the positioning of the tees – still not been moved back yet. It is only 3 weeks until the first major trophy of 2015…………the Anniversary trophy. This will be a drawn out pairs betterball stableford (drawn on the Wednesday before the competition in the Clover at 7pm). Another successful year for our society, and we are 5 years old at the end of January. With a framework now in place for a golfing calendar that provides a mixed selection of competitions for our members, we can look back with pride on those 5 years. There are now 9 major competitions in the year, in general one a month from February until October. Several of these have included an evening presentation at a variety of venues with food and entertainment included. 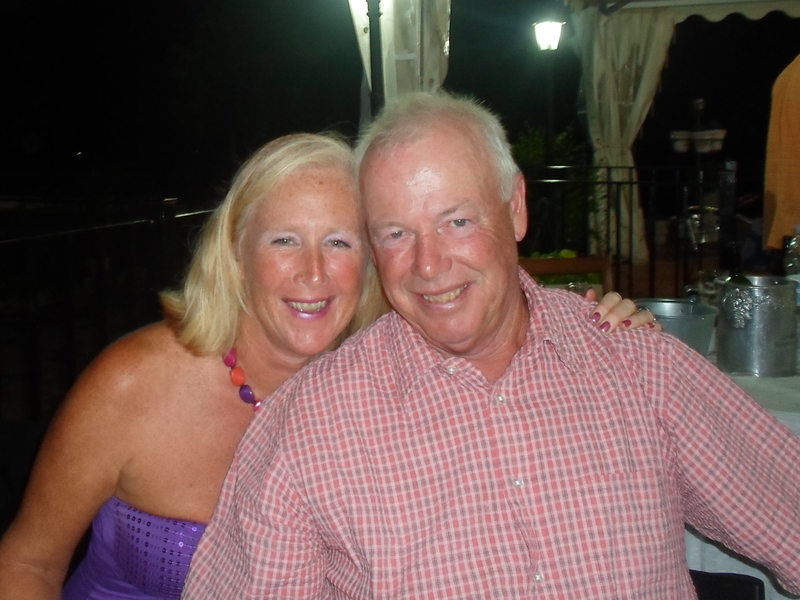 The committee have put in many hours to make it work, and we must thank Cath Emmett-Smith and Graham White for their contribution over the last 5 years, helping develop the society from day one. Unfortunately they have both relinquished their roles, but fortunately we now have Barbara Rollett and Alicia Saunders to help share the workload. It was also sad to see the captain, Paul Briggs, leave Condado and return to the UK at the end of his tenure. Thanks to Kevin Smith who volunteered to remain as president for another year. a hard act to replace……. 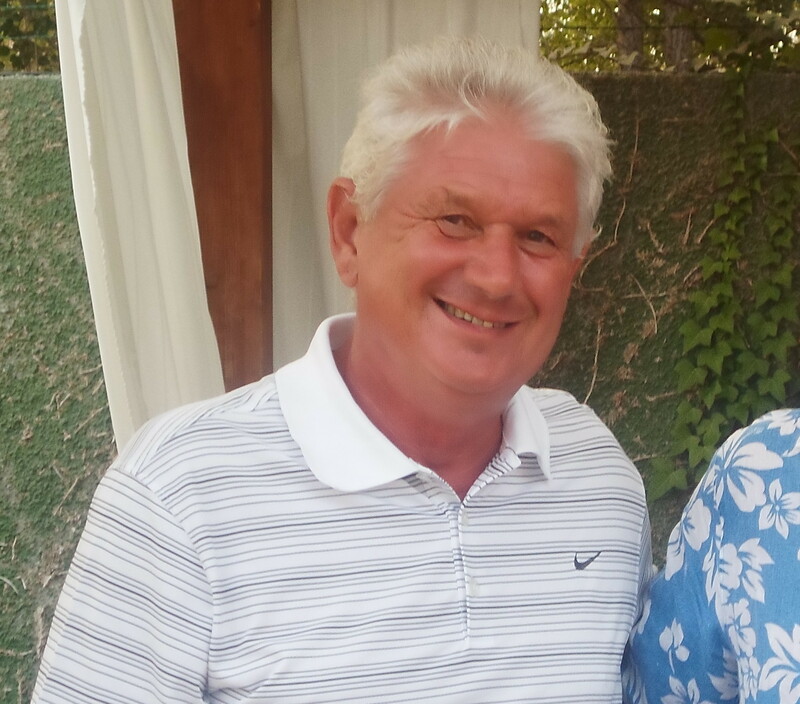 This year’s captain Dave Rollett with Paul…. In January we had the new colour of polo shirt – 2014 was plum, and proved to be very popular. Also available was a sweat top in the same colour for the winter season. the girls look good in them too……. February brought the first major of the year, the Anniversary trophy, and it was won by Simon Newlove and Mick Parsons. A good night at the Condado club. The captain versus President competition was won for the third year running by the captain’s team. 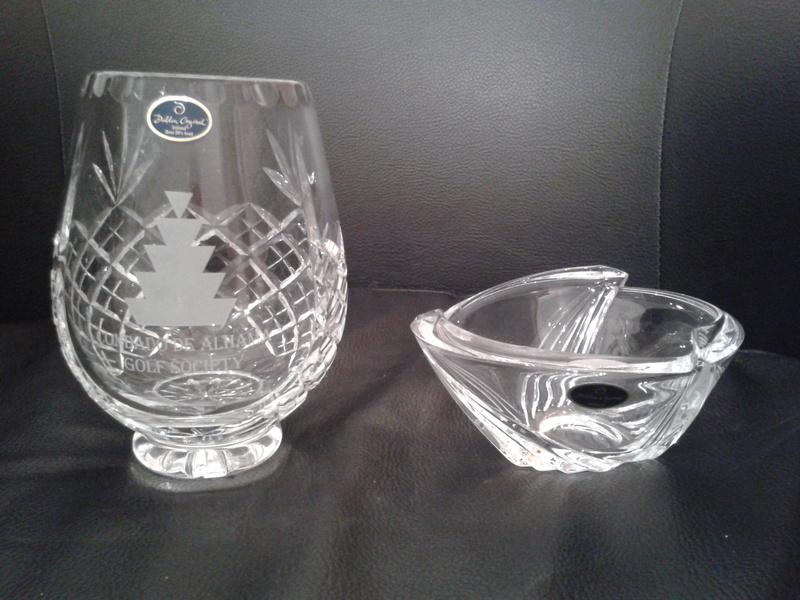 In March a new competition was introduced for the first time, the Dublin Crystal. This was sponsored by Paul Culligan and is played for as an individual stableford 4 times a year. The eclectic competition for course members was won by Mick Parsons. 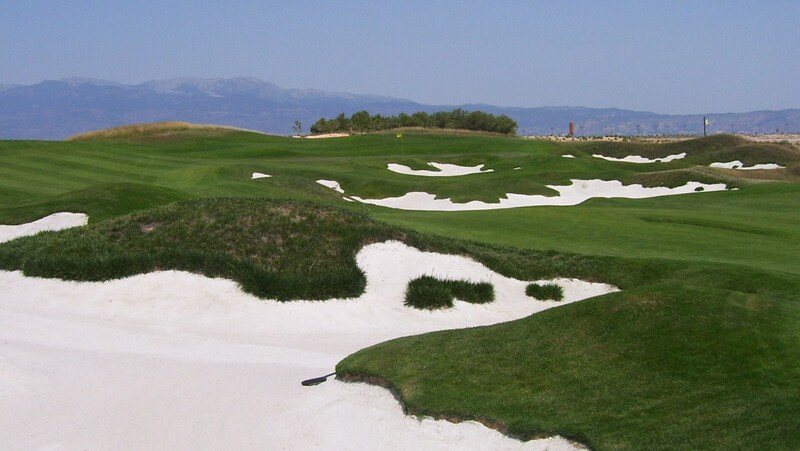 At the AGM it was decided that Monday and Wednesday golf would be unofficial and not subject to handicap revision. 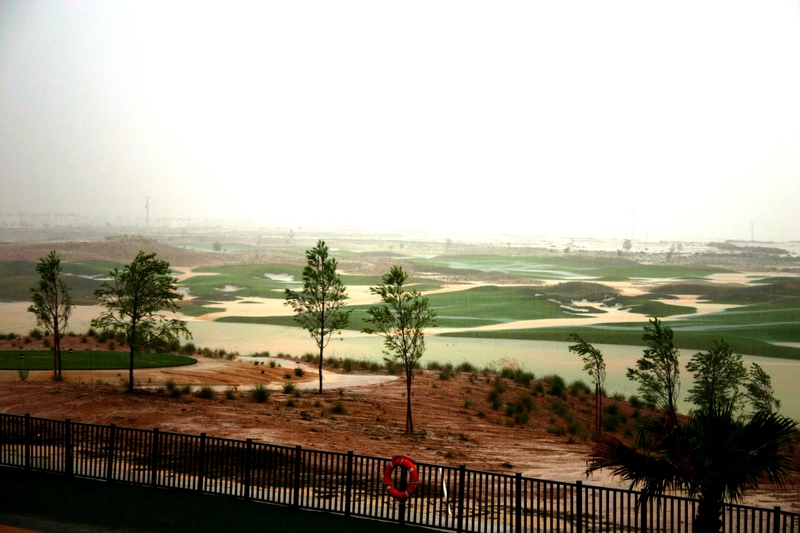 The course was not at it’s best, with dry lakes resulting in a local rule for compulsory drops. 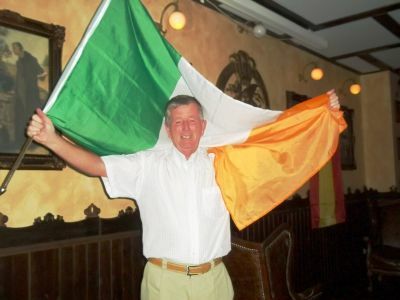 March 17th was St Patrick’s day, and Paul Harrington was the winner. April brought the second major of the year, the Graham White pairs, and was won by the Irish duo of Liam Cawley and Michael Ryder. We also had the St George’s day salver (sponsored by trophy box) and this was won by Barbara Rollett. May saw Dave Rollett become the new captain, and Dave Lloyd was announced as his vice-captain. The Seve trophy was the highlight of this month, and was won by Scott Abraham. The first hollow tining of the year meant that we had an awayday at Desert Springs, and as always it was a great success (apart from the driver getting lost and asking for money for diesel!). The main competition in June was President’s day, and the winner was Neil Simpson. A great night at the Condado Club with Barrington……. he was the one not in fancy dress…….. The next major was in July, the Barry Barker strokeplay, with Alicia Saunders winning the day. A great party after at Copi Coy near Bolneuvo – an outdoor event on a beautiful summer night. 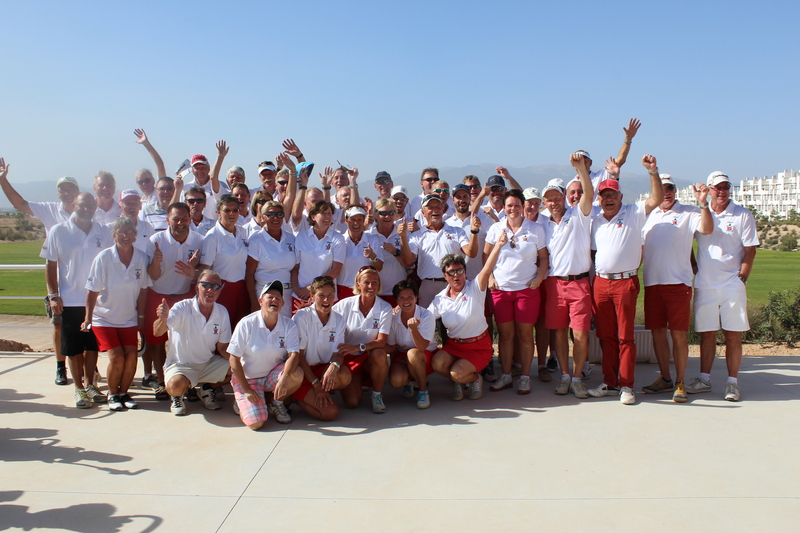 August brought one of the highlights of the year, Captain’s day. Roly Archer came out on top, and another good night was had at Los Balcones. In that month another sponsored team event was provided by Eden Health & Beauty (Al Kasar). Ladies day was in September, and was won by Fran Hobson. 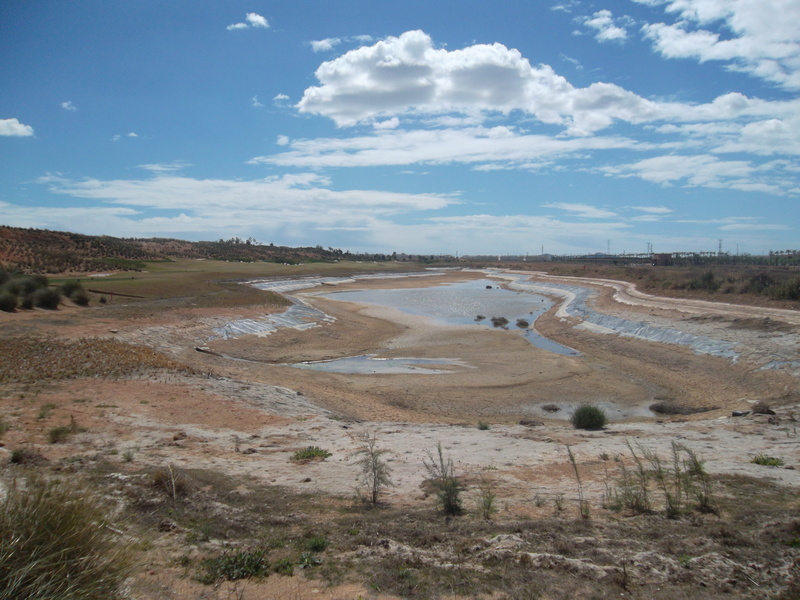 A memorable month due to the downpour we received for a couple of weeks, and which helped to replenish the lakes. Since then water has been added to most lakes and it was fantastic to see them back to their former glory. 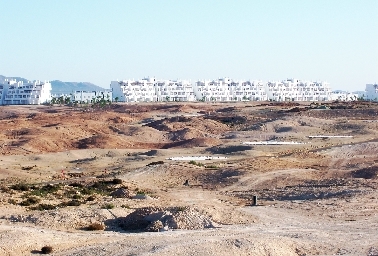 September also brought another awayday, again to Desert Springs. It was also the month in which Europe defeated the yanks (again) and we had a great day in the Clover. not a USA flag in sight…. 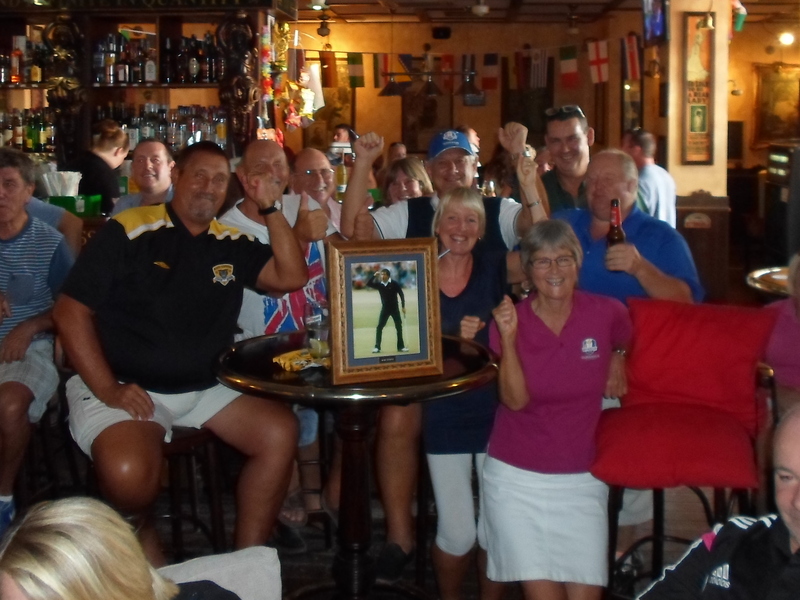 Seve helped us out…. 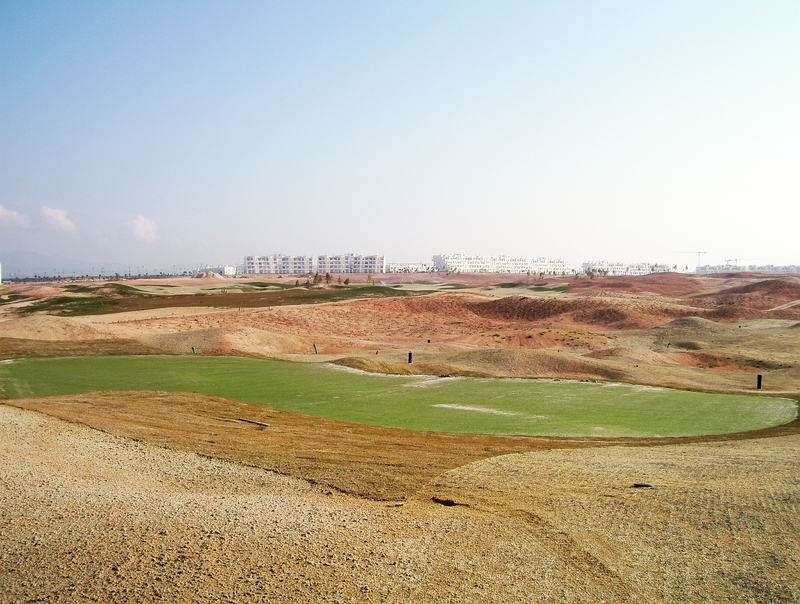 October is always a very busy end to the main golfing season, and we had two majors – the Viking Cup and Seniors. This time the Scandinavians reclaimed the overall advantage, moving 3 -2 ahead overall. Stevie Locker won the Seniors championship, Michael Ryder won the Barry Answer trophy, and and 4 of our players qualified for the Aguilon Ryder Cup event (Spain won!). The Kevin Smith 4 person team in November was won by Peter Ridley, Peter Beatt, Ervine Keldorf and Paddy Kerr. 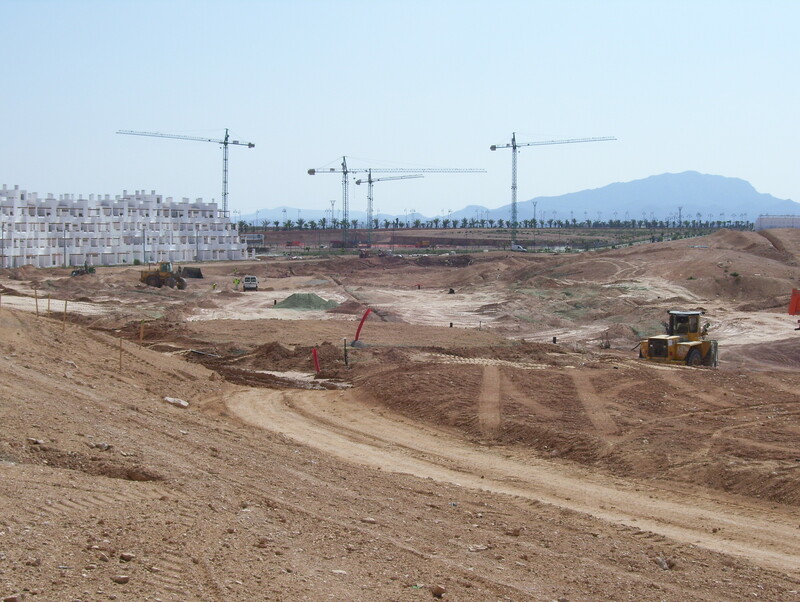 Also due to the course being unavailable to us, we had an awayday at Lorca. Presents for everyone at xmas! Apollo Air also agreed to continue their sponsorship of the monthly individual stableford for a further 12 months. 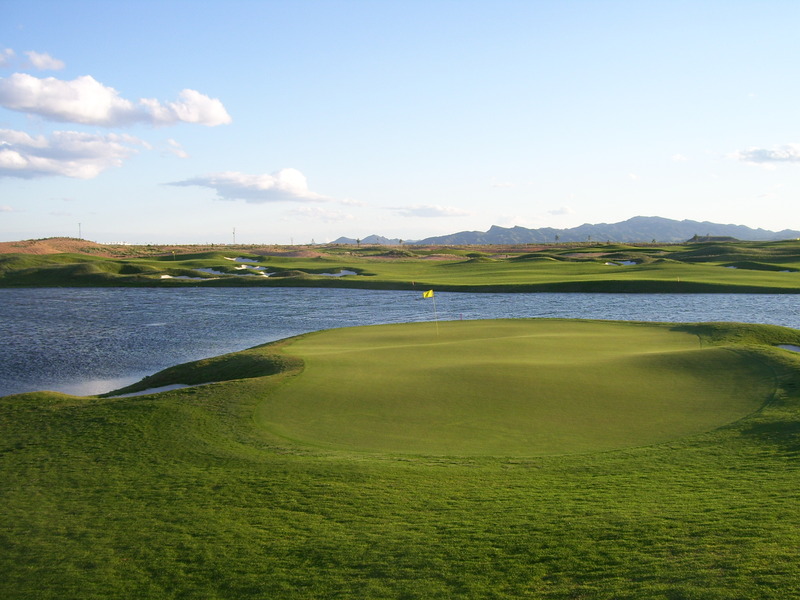 It is fantastic to see the lakes full of water, hopefully the course can only get better in 2015.